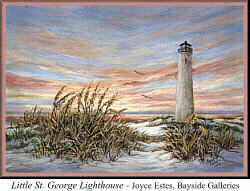 The St. George Lighthouse was built 400 yards from the beach in 1852. After Hurricane Kate in 1985, the lighthouse was on the edge of the beach. It was removed from service by the U.S. Coast Guard in 1994, and collapsed on October 21, 2005. The St. George Lighthouse Association is presently working to restore the historic structure.